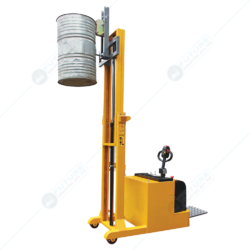 We fabricate a range of Drum Handler, Drum Lifter, Drum Trolley that is an ergonomic drum handling equipment that is used for lifting and shifting of upto 210 liters plastic & M.S. drum handling needs. 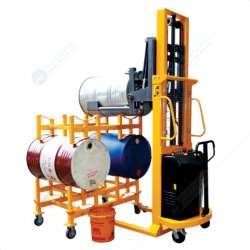 It is equipped with a multi-functional drum truck to facilitate in easy movement of drums on four wheels and acts as a drum cradle for storage and dispensing. Moreover, they are also provided with UHMW rollers that enable easy faucet positioning of drums. Also, the rear axle allows the easy loading and unloading of drums from pallets. 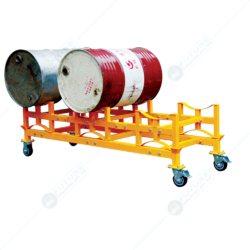 4- Wheeler barrel trolley in order to provide better control, improved safety and easy operation. Easy to be operated by an individual, these drum handling equipment are coated with dully powder and are ready to use. Less lifting force by a reliable Drum Lifter. Easier moving with two big size rollers and one caster wheel. New Model FI-022 DT250 Lifting Capacity (kg/lbs) 250/550 Lifting Height (mm/inch) 345/13.58 Lifting Per Stroke (mm/inch) 22/0.87 Drum Size 57 2 mm (22.5"Diameter), 210 Lifters (55 gallon) Net Weight (kg/lbs) 42/93. We provide our clients with Drum Handling Equipment that is an efficient drum handling equipment, widely used in various industries. These drum jockeys are used for lifting, shifting, tilting & emptying purpose and can bear a load of up to 210 liters plastic. 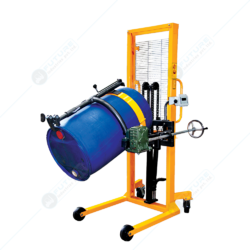 Made by applying best quality raw material and the most updated industrial standards, the offered range of Drum Handler made by us has been in demand for its quality and sturdiness along with a feature of durability. We are availing this whole range to our clients in as per their convenience and predefined specifications. 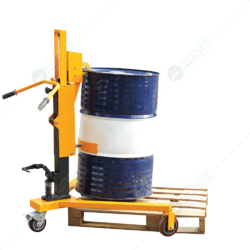 The range is highly ergonomic in drum handling equipment and allows to move drums on four wheels and acts as a drum cradle for storage and dispensing. 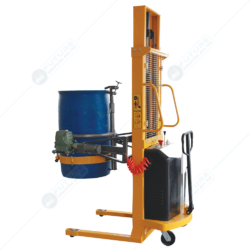 Available with us is a range of Drum Handler that is applicable in various industries and is offered at industry leading prices. High on norms of durability and reliability, these can be custom-made from our side as per the specifications provided by the clients. Designed to store two to three drums per stand, this limit can be extended up to 3 times as per the clients' requirements. The front and back fork entries facilitates an easy movement of drum racks. Keeping in sync with the times, we also offer an unmatched range of Drum Equipments. These products are widely used to save storage space and are designed to have trim, tough, all steel, welded construction for strength, which has excellent capacity to control it. Two 8" polyolefin wheels and one 4" swivel caster give this 1200 lb. Further, clients can utilize these products as per the specifications provided by them. Highly ideal for the purpose full maneuvering of drums in any congested area, the offered range of these Drum Dollies is in wide demand for its quality and other variegated features. The featured range easily prevents drum tipping or sliding. We have been in wide recognition for offering this range in the most comprehensive and convenience prices to our clients. The drum dollies range is made of best quality raw material. 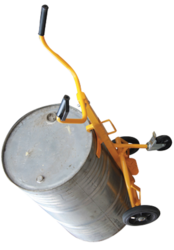 Our clients can avail from us an exquisite range of Drum Handler with Trolley. The offered range of products are easily operated by an individual, coated with dully powder and are ready to use. 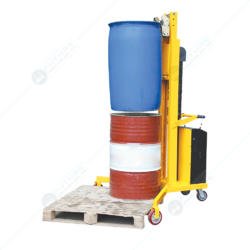 Equipped with a multi-functional drum truck to facilitate in easy movement of drums on four wheels and acts as a drum cradle for storage and dispensing. Further, these products are provided with UHMW, which allows the easy loading and unloading of drums from pallets. Our range is appreciated to provide better control, improved safety and easy operation. All-welded steel frame handles loads up to 300 Kgs.